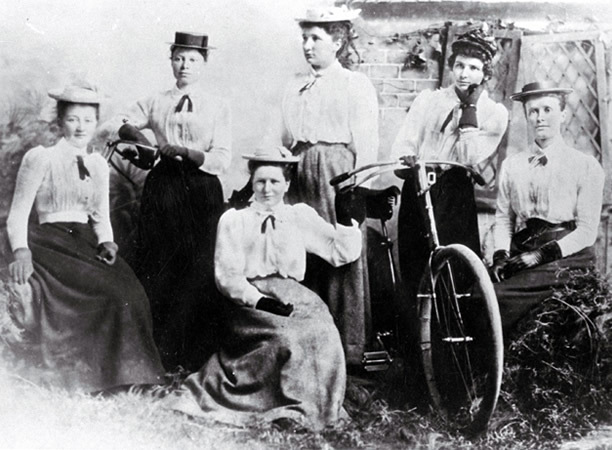 On the night of 18 August 1892, cycling enthusiasts gathered in Christchurch to discuss the formation of a cycling club for women. The male president of the Bicycle Touring Club presided over the meeting, but it was Alice Burn who put forward the motion that a women’s club should be formed under the name ‘The Atalanta Cycling Club’. It was hoped the club would make cycling popular with women and reduce prejudice towards female cyclists. The development of the modern bicycle in the 1880s promised women more freedom to travel without the need for a male chaperone. Cycling opened up new social worlds, but it wasn’t without its dangers. Women cyclists were sometimes jeered at, abused and even pushed from their bicycles. Members of the club sometimes cycled with brothers or husbands to protect them against such attacks. From the first meeting, the topic of uniform was debated. Women’s clothing of the 1890s was cumbersome, with long skirts and corsets. For cycling, women had a choice of divided cycling skirts or ‘dress reform’ attire such as bloomers and knickerbockers. Dress reform was often associated (in an unflattering manner) with the feminist movement. In September 1892 the Atalanta Club decided that members could choose their own clothing, so long as the club colours were prominent. A year later, however, it was resolved that the uniform should be a plain skirt with a cream blouse, with colours navy and blue. The Atalanta Cycling Club existed for at least five years and organised many cycle touring events for its members. After the club dissolved, women’s cycling continued. We have 12 biographies, 4 articles, related to First women's cycling club in Australasia formed.